Objectives of mass spectrometry laboratory are to conduct the long-term research and experimental development in physics and technology, achieve the international level competence; to apply mass spectrometry methods to the environmental research, nuclear safety, radioecology fields; to develop new areas of research in biomedical investigations and biotechnology; to participate in international research programs; to cooperate with domestic and foreign institutions of higher education in preparing highly qualified specialists. Mass Spectrometry Laboratory offers a complete radiocarbon dating service for a range of materials such as sediments, wood, charcoal, bone, water foraminifera, and peat used in archaeology, geology, environmental and atmospheric studies. MSL is equipped with single stage accelerator mass spectrometer (SSAMS, NEC, USA) since January 2016. An accuracy of the measured 14C/12C ratio is better than 0.3 %. 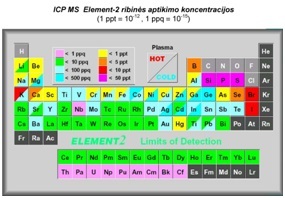 Radiocarbon dating in MSL implies sample pre-treatment, graphitization using elemental analyzer (EA, Vario Isotope Select, Elementar, GmbH) connected to the Automated Graphitization Equipment AGE 3 (IonPlus AG).